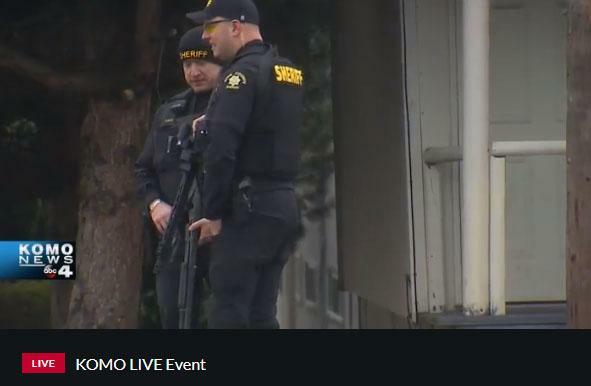 Just two days after a tragic mass shooting in a Florida high school, moments ago the campus of Highline College in Des Moines, WA was put on lockdown following reports of shot fired. A large police presence is gather around the school and along Pacific Highway S.
Families that are looking for information or need a location to go are being directed to the northwest corner of the Lowes parking lot, the Renton Police Department said in a tweet. The Renton Police Department tweeted multiple agencies assisting for the report of shots fired, but nothing has been confirmed yet. "WSP assisting and shutting down SBound Pacific Highway S, between 240th and Kent DesMoines Rd. Please avoid area if possible while agencies continue to evaluate situation at Highline Community College./sh"
The Renton Police Department also tweeted multiple agencies assisting for the report of shots fired, but nothing has been confirmed yet.